So if you would like to commission your own design ring just how do you go about it? Firstly of course is what is your ideal design? what sort of ring would you like? A Solitaire? a 3 Stone? Eternity? Cluster? and have you seen an example or something close to what you would like somewhere? If you have and if you can then send me a picture or a link to the one that has caught your eye. As someone once said a picture speaks a thousand words, so any picture even if only as a starting point can save everyone a lot of time. A thumbnail sketch can do just as well by the way, and you don't have to be any sort of an artist either :-) It just needs to show the basic components of your design, whatever it is you would like for your own, special, personal design. Decide which Metal would you like it made from? Platinum in particular is very good for setting Diamonds. Rare and very precious, dense, won't tarnish, polishes to a high white finish, more resistant to scratching and much stronger than Gold. In most ways its the ideal metal for a ring that is worn all the time, but at a premium in price of course! Gold. Eternally popular and comes in a variety of colours, pure 22ct yellow, pale 9ct yellow, 18ct White Gold, 9 & 18ct Rose (red) Gold or even faintly green tinted. and Silver of course. Bright white and with a long and distinguished history. Decide on your budget (gulp). Is it realistic for your design? especially if its for a solitaire Diamond? Please try and be as realistic as possible about this. While I can certainly give you better value for money than any High street shop version I can't give you a 'D' colour 'Flawless' clarity 2ct Diamond for £1000.00! and anyone who tells you they can is either a conman or a liar I'm afraid :-( A quick online search for "Diamond Brokers" will give you a LOT of hits, and browsing a few will give you a good idea of standard prices and the way they vary with the size, shape and quality of the gemstones. What sort of Diamond would you like? Round Brilliant? Princess? Oval? Pear? Marquise? You'll need to bear in mind that Diamond prices don't go up in a nice simple and smooth progression. Its more like climbing a staircase with rather uneven steps! For instance you gets steps at 1/4ct, 1/2ct, 1ct and so on. So two 1/2ct stones would definitely be less in total than the price of an equivalent cut, colour & clarity single 1ct Diamond for example. You get similar uneven steps with Colour grades. So a 'D' colour Diamond is going to be a lot more expensive than an equivalent 'H' colour, which will still be quite a lot more than a 'K'. Likewise the price difference between Clarity Grades jumps unevenly as you go up between the 'I' (or 'P'), SI, VS and VVS grades. As a very rough rule of thumb you can double the price each time you go up a full grade e.g. I1 to SI1. The shape of the cut Diamond also affects the price depending on what's in fashion and what isn't. Round Brilliant cut stones usually being at the top and the benchmark against which the others are measured, but Princess cuts come very close at times. These are the basic '4C's that determine the price of a Diamond. Carat, Colour, Clarity & Cut. There are lots of other factors as well of course, for instance a GIA certificate can increase the price of a stone by 25%, and the quality of the 'Make' (how well its cut and polished) can have a similar effect on its value. 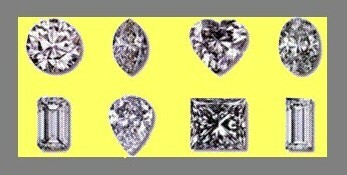 There's a bit more information on the 'Four C's':- Carat, Colour, Clarity & Cut, here if you would like to learn more. And then I will work out the costs and availability of the materials, how long it would take me to do it and I'll reply with an estimate and/or suggestions. You aren't committing yourself to anything at all at this stage of course, and it can't cost you anything to ask can it? :-) Email is by far the most reliable way of contacting me by the way. If you like my estimate I'll send you a firm quote and ask you to send me a deposit. If it doesn't quite fit :-) then I'll do my best to suggest some other options for you e.g. a different metal or a different specification Diamond, to get you to what you want. Then I'll create your own unique ring for you. Comments? Questions? (typo's?) Email me on bd.unitt@hand-crafted-rings.com I'll get back to you as soon as I possibly can.